Sorry to have gone a little MIA last week...I spent the days I had to work running around trying to get everything done, and then switched immediately to cooking mode to prep for the nearly 20 people we had in our apartment on Thanksgiving! It was a complete success, with enough leftovers to get us through the weekend. After that came lazy mode (...and a little shopping, what can I say). 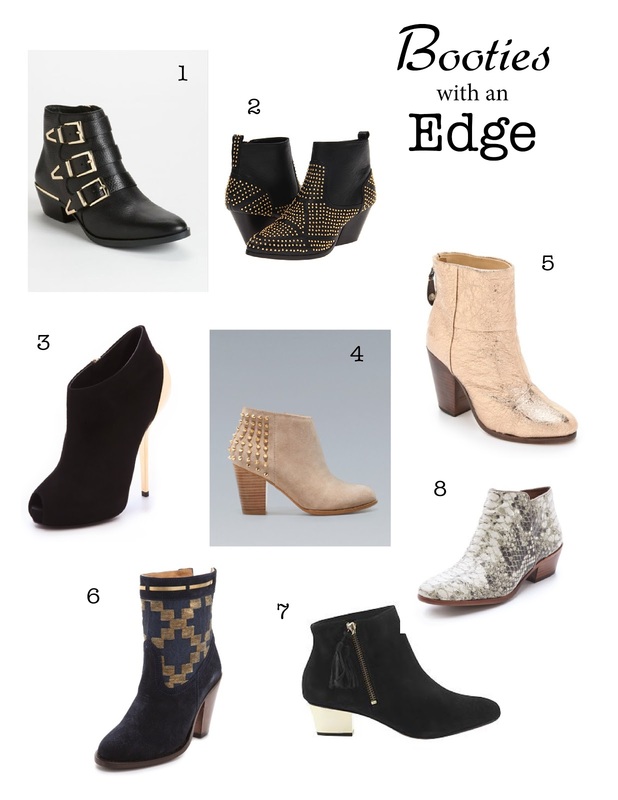 I'm on the lookout for some new shoes & after two recent purchases of studded pieces, I've decided boot(ies) with an edge is my new thing for this season. The key thing to look for is an unexpected detail or fabric, whether it's a rich dark color, studs, or-my latest favorite-shiny, gold metals. I think those gold Rag & Bone's might be my next investment. Aren't they completely FABULOUS? I love number 6! It is different from all other boots that I have seen this fall. Agreed!! I love that the pattern is slightly southwestern. I LOVE #2, so cute! Me too! Wedge heels in boots are growing on me. I might need a pair this winter! Oooo, I want #4. Love that color and look! ...I own them ;) They're definitely worth it!! OMG! Those Rag & Bone boots are FAB.